in der griechischen Moderne Architektur. Born in Corfu – Greece on 13 September 1905, first son of Aristidis Sakellarios and Thalia Mavrogianni. Attended primary and secondary schools in Corfu and Thessaloniki. Completed his secondary education at the Technical Department of the Calvin College in Geneva (1920 -1921). During this period, he won two of the prestigious „Monteseigny Foundation“ scholarships. He studied Architecture at the Technical University in Graz (1924-1930) under Karl Hoffman and Friedrich Zotter, followed by a brief spell at the Bauhaus under Walter Gropius. Married to: Antigoni Petrocheilou (1932- 1935), Ina Pappou (1937-1945), Valentina Theotoki (1947-1957), Koula Kampani (1968-1972). One daughter: Elisabeth Sakellariou-Herzog. Pericles Sakellarios died on March 5,1985 in Athens. Today his buildings have successfully stood the test of time and are recognised as defining contribution to Post-War Greek Architecture. At the beginning of his career, he worked for a short spell as an assistant to Andreas Kriezis (1887-1962). His projects include the remodeling the old Royal Palace to accommodate the Greek Parliament and Senate. In 1931 he moved to Volos where he worked for the Technical Service of the Township of Pegases until 1935. In he returned to Athens where he was employed by the newly formed Technical Service of the Ministry of Public Health and Welfare. The period of 1936 to 1941 was the most creative periods in his life and career. During this time, in addition to numerous private commissions, he was appointed as the official architect of King George II of Greece. He remodeled the Royal palace of Tatoi, Royal palace of Psychiko and Mon Repos in Corfu. During the German-Italian Occupation he served in the Greek armed forces. In the following Greek Civil War he was held hostage by ELAS, the military arm of the National People’s Liberation Army from which he was liberated by the Allied forces. Still working as a civil servant he was chosen as the official representative of his Ministry to visit Britain and the United States where he was informed of developments in hospital architecture. In 1947 he abandoned his career as a civil servant and set up his practice as a free-lance architect. He also formed a collaboration with Manolis Vourekas (1905-1992) and Prokopis Vassiliadis (1912-1977). Projects resulting from this collaboration include the avant-garde Astir Beach and resort facilities in Glyfada (1955-58), the Public beach in Vouliagmeni and the Argo and Oceanis restaurants (1959-61). In1960 he was chosen by Walter Gropius as an associate of the architectural firm TAC (The Architect’s Collaborative) for the construction of the new U.S Embassy in Athens. In 1966 he set up his first joint practice under the name “ P.A.Sakellarios and Associates“. His partners were his daughter Elisabeth Sakellariou-Senkowsky, her husband Hermann Senkowsky and his future wife Koula Kampani. Sakellarios was a member of the Technical Chamber of Greece, the Architect’s Association, and the Hellenic Architectural Society. He served as a board member of the International Union of Architect’s (UIA). He acted as technical advisor to the Greek National Organization and to the Psychiko Community. In he was designated Commander of the Royal Order of the Phoenix, an honour awarded to him for his contribution to the country’s reconstruction. In the Technical University of Graz awarded him an honorary diploma for his exceptional half-century of professional practice. 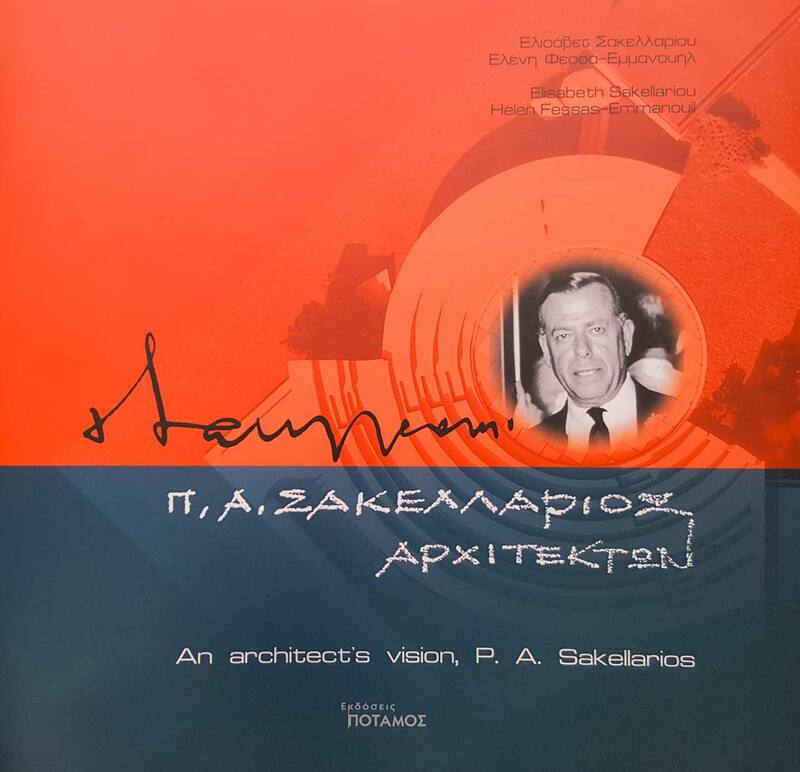 Pericles Sakellarios was one of the leading figures in Greek architecture between 1936 and 1962. He constitutes a special case in his generation owing to his fifty-year career, a creative career made possible by the calm relations he maintained with his people, his country and his age. The products of Sakellarios‘ rare abilities and mild modernity included some exemplary buildings and complexes-mainly houses that attracted the interest of the international architectural press then, but have also stood the test of time. He was able to slide over the boundaries of culture and style and this makes his work interesting. He moved easily between designing homes for the leisured into designing the new public architecture of leisure tourism: open-air cinemas, theaters, motels and beach resorts.